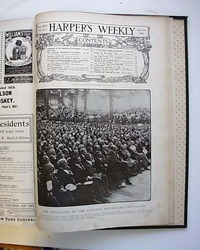 HARPER'S WEEKLY, New York, May 5, 1900 The Opening of the Paris Exposition; The Boer War; doublepage centerfold "The Sunday Crowd At The Paris Exposition"; and other news of the day. See photo for full details. 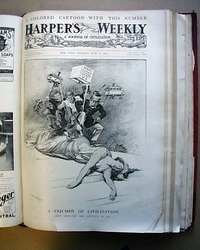 HARPER'S WEEKLY, New York, November 3, 1900 Tientsin; The Taking of Peking; doublepage centerfold "The Drought In The Southwest" by Frederic Remington; The Evil Men In The Passion Play; The Warren Street Disaster; front page photo of John Sherman; and other news of the day. See photo for details. 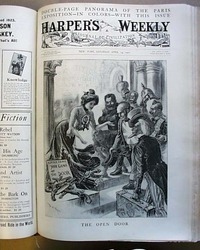 HARPER'S WEEKLY, New York, October 13, 1900, Colored front page of Richard Croker; The Cost of Tammany Hall in Flesh and Blood; Moose Season in Maine; doublepage centerfold political satire cartoon of William J. Bryan; poem "The Young Queen" by Kipling; and other news of the day. See photos for full details. 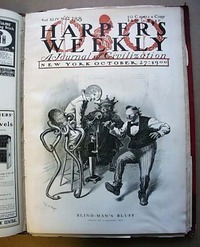 HARPER'S WEEKLY, New York, October 6, 1900 Hurricane at Galveston; Pennsylvania Coal-Miners Strike; Tientsin after its Capture; A Japanese Memorial Service; doublepage centerfold "A Mutual Surprise" by Deming; and other news of the day. See photos for full details. 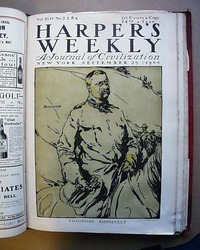 HARPER'S WEEKLY, New York, September 29, 1900 Front page colored illustration of Theodore Roosevelt; Hurricane at Galveston; Pennsylvania Coal-Miners Strike; doublepage centerfold of a political satire of William J. Bryan as William Tell; Launching of the Monitor "Wyoming"'; and other news of the day. See photos for full details. 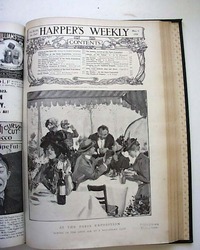 HARPER'S WEEKLY, New York, September 8, 1900 Photos from Tientsin; fullpage "Saturday Afternoon At A Country Club" by Hutt; doublepage centerfold "The Chinese Club At Shanghai"; J.H. Taylor's First Exhibition Match (Golf); and other news of the day. See photos for full details. "What Might Have Been If The Original Thirteen States Had Never Been Expanded", by W.A. 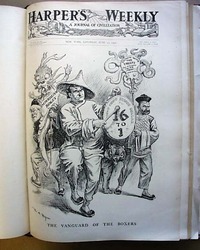 Rogers; Prisoners of Peking; Peking and Tientsin; Korea of To-Day; Zinc-field of Arkansas; "The Fishermen of San Francisco" by W.A. Rogers; and other news of the day. See photos for full details. 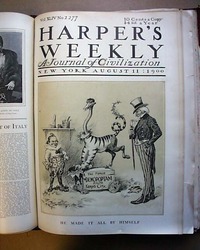 HARPER'S WEEKLY, New York, August 11, 1900 The New York Yacht Club; doublepage centerfold "The Paris Exposition - Illumination of the Grounds in the Evening" by Graham; The ladies of the Peking Legations; and other news of the day. See photos for full details. 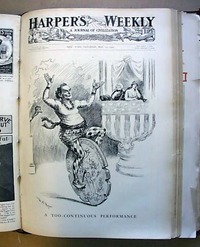 HARPER'S WEEKLY, New York, August 4, 1900 Fullpage "Summer Days Awheel" bicycle illustration. American Troops Ordered to China; Cape Nome Beach and Tundra Placer Mines; The Boxer Uprising in Peking; the Assassination of King Humbert of Italy; and other news of the day. See photos for full details. 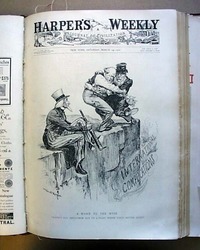 HARPER'S WEEKLY, New York, July 28, 1900 Full page cartoon illustrations of baseball scenes. The Philippines - Our Approach to Asia; Scenes in Tientsin and Tong-Ku; The War in Siberia; and other news of the day. "Our Ambassadors Abroad" has mention of Professor Andrew Dickson White, co-founder of Cornell University. See photos for full details. 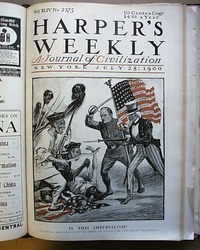 HARPER'S WEEKLY, New York, July 14, 1900 The National Democratic Convention; Fire in New York Harbor; War-ships in Chinese Waters; douplepage centerfold "The National Democratice Convention In Session, Kansas City, July 4-6, 1900"; Chinese in New York City; Intercollegiate Boat-Races; and other news of the day. See photos for full details. 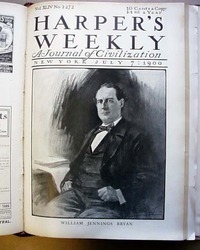 HARPER'S WEEKLY, New York, July 7, 1900 Front page illustration of William Jennings Bryan by Chominsky; Disturbances in China; The Paris Exposition; doublepage centerfold "The Fourth of July at Kansas City" by Rogers; The Yale-Harvard Boat Race; and other news of the day. See photos for full details. 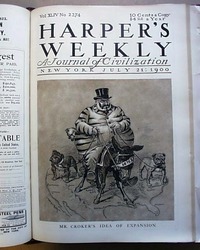 HARPER'S WEEKLY, New York, June 23, 1900 The "Boxer" Troubles in China; The Paris Exposition; The Chinese Parade in Sacramento; and other news of the day. See photos for full details. 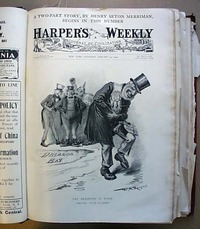 HARPER'S WEEKLY, New York, June 16, 1900 The Golden Gate Park at San Francisco; The Paris Exposition; Watching a Total Eclipse; a full-page colored political cartoon; and other news of the day. See photos for full details. 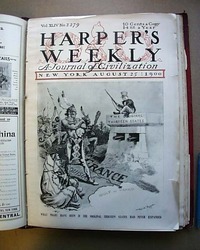 HARPER'S WEEKLY, New York, June 9, 1900 Doublepage centerfold "One Of The Season's Most Popular After-Dinner Speakers" by Walker; The Paris Exposition; Cape Nome; The Boer War; and other news of the day. See photos for full details. 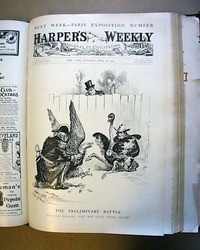 HARPER'S WEEKLY, New York, June 2, 1900 Uncle Sam cartoon on the front page; The Paris Exposition; "The Bubonic Plague In San Francisco"; doublepage centerfold "Decoration Day, 1900" by Keller; and other news of the day. See photos for full details. 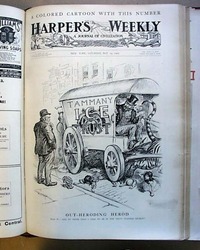 HARPER'S WEEKLY, New York, May 26, 1900 Frontpage "The Coaching Season In New York - A Quick Change On The Road" by Klepper. Doublepage centerfold "The Paris Expositon -- Sight-Seers Of All Nations" by Blumenschein. 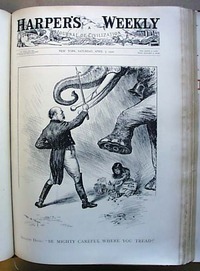 The Message of President McKinley; The Populist Conventions; The Boer War; and other news of the day. See photos for full details. 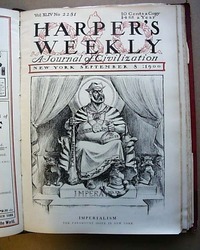 HARPER'S WEEKLY, New York, May 19, 1900 Portrait sketch from life of "Brigadier-General Joseph Wheeler"; The Paris Exposition; The Klondike Output for 1900; colored fullpage political cartoon; and other news of the day. See photos for full details. 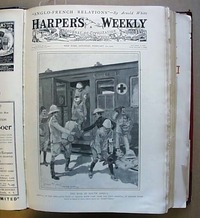 "Arrival In Paris - No Room"
HARPER'S WEEKLY, New York, May 12, 1900 Doublepage centerfold "Arrival In Paris - No Room" by de Thulstrup. Scenes at the Paris Exposition; The New York Music Season of 1899-1900; and other news of the day. See photos for full details. 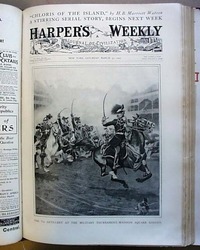 HARPER'S WEEKLY, New York, April 28, 1900 Doublepage centerfold: "Bay Snipe Shooting" by Frost. The Paris Exposition; Racing Automobiles; Breaking of the Colorado River Dam at Austin, Texas; and other news articles of the day. See photos for full details. 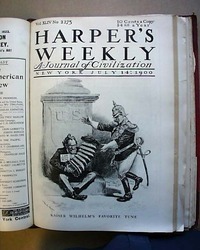 HARPER'S WEEKLY, New York, April 21, 1900 Doublepage centerfold: "The Land Defences Of Havana". 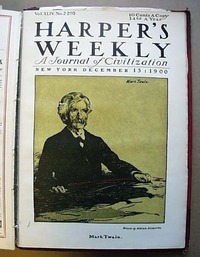 This contains an article on Rowing at Harvard; the Paris Exposition; and numerous news articles of the day. See photos for full details. 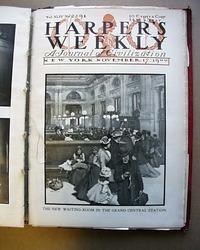 HARPER'S WEEKLY, New York, April 14, 1900 Colored doublepage centerfold "General View of the Paris Exposition of 1900". 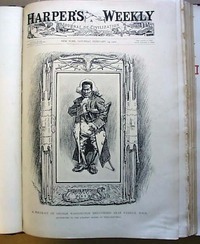 Frontpage "The Open Door". 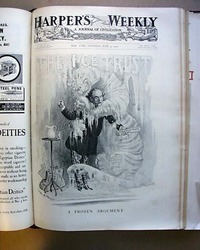 This issue also contains numerous news articles of the day. See photos for full details. 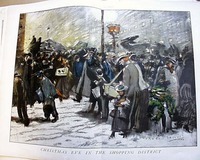 HARPER'S WEEKLY, New York, April 7, 1900 Doublepage centerfold "Called By The Easter Bells, Believers Come To Praise" by Sterner. 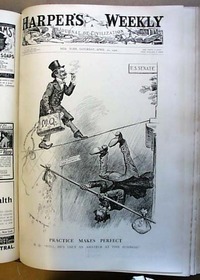 Front page "Senator Davis: 'Be Mighty Careful Where You Tread!'". This also contains numerous news articles of the day. See photos for full details. 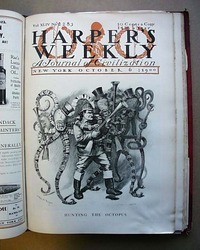 HARPER'S WEEKLY, New York, March 24, 1900 Doublecenterfold print "The Fighting Flag-Ships of the United States Navy". 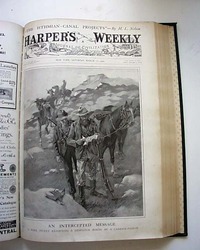 Fullpage "Working Snow-Bound Ponies Out Of The Mountains" by Remington. 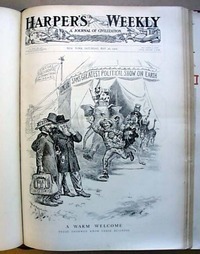 Frontpage Uncle Sam cartoon. This also contains numerous news articles of the day. See photos for full details. 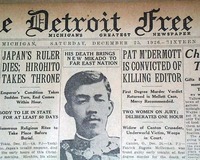 DETROIT FREE PRESS, Dec. 25, 1926 Front page 3 line, 2 column head: "Japans Ruler Dies; Hirohito Takes Throne" & subhead. One col. photo of the late Emperor Yoshihito, who was Hirohitos father. Browning at the edges. 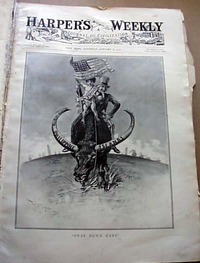 HARPER'S WEEKLY, New York, March 10, 1900 Doublepage centerfold: "The Frozen Sheep-Herder" by Remington. 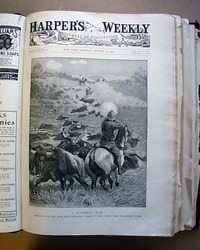 This issue covers the reports of the Boer War as well as other news of the day. See photos for full details. 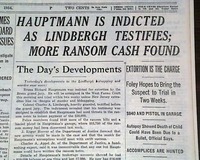 NEW YORK TIMES, Sept. 27, 1934 Front page 3 line, 3 column head: "Hauptmann Is Indicted As Lindbergh Testifies; More Ransom Cash Found" & subheads: "Extortion Is The Charge" "$840 & Pistol In Garage" "Autopsy Showed Death of Child Could Have Been Due to a Bullet, Official Says". Rag edition. 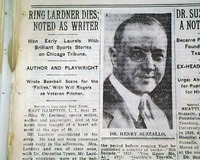 THE NEW YORK TIMES, Sept. 26, 1933 Page 21, two line, 1 column head: "Ring Lardner Dies; Noted As Writer" & subheads: "Won Early Laurels with Brilliant Sports Stories on Chicago Tribune" "Wrote Baseball Scenes for the Follies, With Will Rogers as Veteran Pitcher". 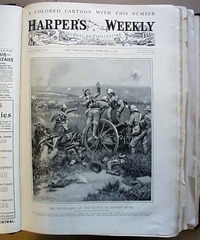 HARPER'S WEEKLY, New York, February 24, 1900 Doublepage centerfold "The Battle At Spion Kop" illustration. 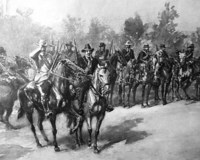 General Lawton's Last Fight - December 19, 1899. 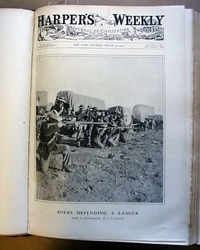 Several illustrations of the Boer War. This also contains numerous news articles of the day. See photos for full details. 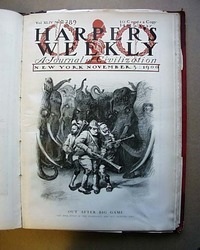 HARPER'S WEEKLY, New York, January 27, 1900 Double centerfold "Sketches in Mexico". An article on the Cycle-Automobile Show. Scenes of the Paris Exposition Buildings as they appeared at that time; and other news articles of the day. See photos for full details. HARPER'S WEEKLY, New York, January 20, 1900 The doublecenterfold shows 8 mural decorations for the Appellate Court in New York City as well as 3 additional scenes on the next page. This also contains numerous news articles of the day. A small golfing cartoon "Caddy Conversation". See photos for full details. MEXICO EVENING LEDGER, June 8, 1950 from Mexico, Missouri. 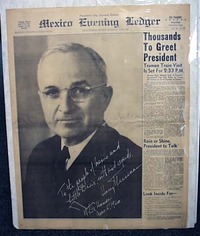 This issue features a nearly page-size photo of President Truman with the headline "Thousands To Greet President" and "Rain or Shine President to Talk". This is the outer leaf only and is in nice condition. See photo for fuller details. 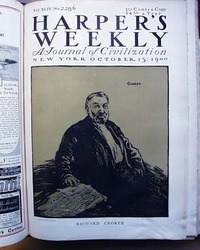 SCIENTIFIC AMERICAN, November 5, 1904, from New York. 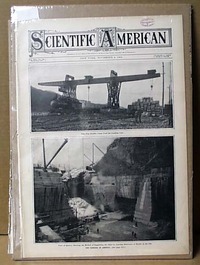 This issue contains articles about fifty-ton elecric Cranes being used for loading cars. 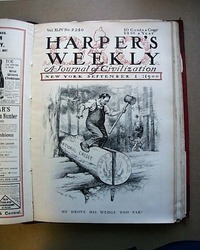 The Carrara of America, the view of quarry showing the method of marble cutting along with other interesting articles, illustrations, and ads. 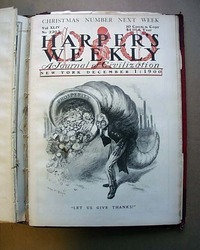 This is a full issue and is in good condition. See photo for details. 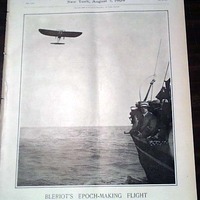 HARPER'S WEEKLY, New York, August 7, 1909 Full front page photo: "Bleriot's Epoch-Making Flight", shows Bleriot in flight over the English Channel, with part of a sea vessel in the foreground. 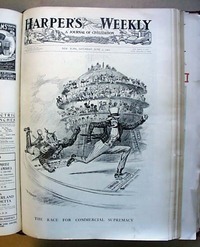 Many other prints are present as well, along with news of the day and period advertisements. 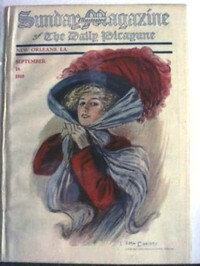 SUNDAY ILLUSTRATED MAGAZINE OF THE DAILY PICAYUNE, New Orleans, September, 18, 1910. A great issue for framing and displaying! 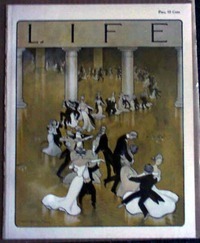 LIFE MAGAZINE, New York, April 20, 1905. A great issue for framing and displaying!